Fish finder & AM FM stereo with 4 speakers. Prestige trailer, single axle with attached spare tire. Anchor. Life jackets. Fire extinguisher. Ski ropes. Dock bumpers. Spare propeller. Fish finder. AM FM stereo with 4 speakers. Excellent Condition & ready for the water. Priced to sell. Maintenance x2 annually. Fiberglass. Detailed/buffed February 2019. 4.3 Volvo Penta 4.3 Engine. Bikini top, cockpit & boat covers. 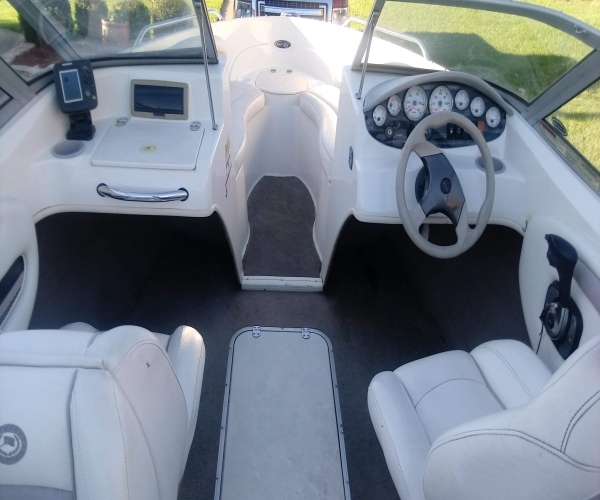 AM FM Stereo, Fishfinder, docking lights, carpet flooring. Hydraulic trim. Swim step with fold down ladder. Prestige single axle trailer with spare tire included Xtras include anchor, life jackets, ski ropes, fire extinguisher, spare propeller & gas can.